Preheat oven to 350°F. Place pecans on a baking pan and cook for 8 minutes in the oven. Allow to cool. Divide spinach evenly among four plates. Cut radishes into fourths or slice thinly and arrange on top of spinach. Top with tomatoes and pecans. In a measuring cup, whisk together lemon juice, mustard, salt, and pepper. Slowly whisk in olive oil. 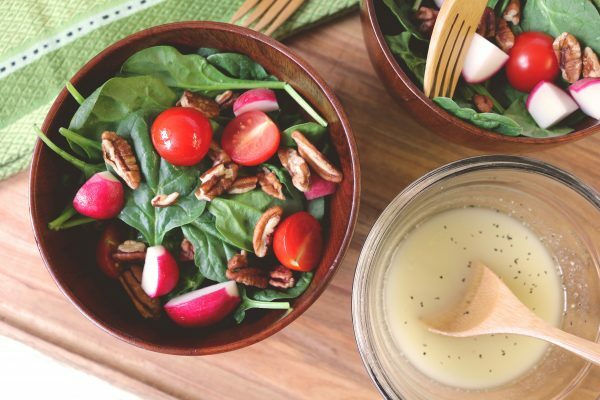 Drizzle dressing over each salad. Divide among 6 plates and enjoy! Baby spinach is simply young spinach. It’s more tender than regular spinach and doesn’t require the stems to be removed. Toasting almost every kind of nut intensifies the flavor. Toast big batches of pecans and then freeze for later. The salad dressing comes together in a snap in the blender or a food processor. Dijon mustard holds the olive oil and lemon juice together so they do not separate quickly. Lemon juice brightens up this dish so that less salt is needed.